This book has all of that PLUS gelato. Soooooo…..it’s pretty much a given that I’m going to LOVE it. Ditched by her rubbish husband on Friday 13th, Kate packs her suitcase full of her quirky homemade couture and jumps on a plane to Rome. Obvs. There we meet a colourful cast of characters including the brooding romantic Alessandro, a policeman who steps in to help our heroine when she’s had one too many glasses of vino (we’ve all been there…but perhaps just not on The Spanish Steps). With his protective Mama and five sisters, will their love ever get off the ground? 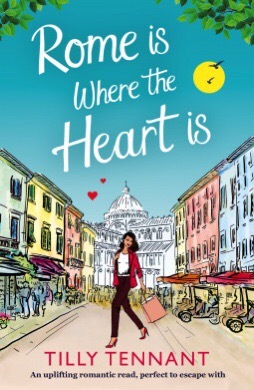 Set in a such beautiful city, this book makes you feel like you’re actually walking the cobbled streets of Rome, tasting the delicious food & sipping on the finest Italian wine. When really I was wrapped in a blanket, munching on a hobnob and nursing a mug of sweet tea (it’s been a tough week) I love to travel! A perfect holiday read, whether you’re actually leaving the house or staycation-ing like me. (Even better when you know the follow-up book is out now too…I won’t tell you the title because it kinda gives it away….) Get your Italian Escape here….a bene five cwtches!